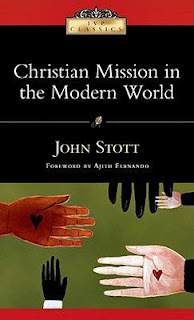 In Christian mission in the modern world, John Stott seeks to communicate the biblical meaning and importance of mission, evangelism, dialogue, salvation and conversion. In one way this is a book for the specific time in the church’s history a few decades ago when it was originally written. Stott quotes and analyses heavily the books, conferences talks and academic papers that were having a significant impact on discussions of mission and evangelism. Most of these would be unfamiliar to most reading the book now which can make a few spots a little hard to get through. While the voices have changed the arguments tend to stay the same. Even with the shift from modernism to postmodernism to wherever we are going next, questions like what it means to evangelize, how to understand the Christian responsibility for social justice and how Christians should approach dialogue remain important. Stott provides a solid, ballanced biblical analysis of these issues. It is particularly helpful in dealing with the currently fashionable idea that just doing good is an acceptable substitute for actually telling people about the gospel. On the flipside, it also rebuts those who would preach but not help with peoples practical needs. Despite the dated content, I very much recommend it for an evenhanded look at issues of evangelism and mission that remain contentious but important today.